LinkedIn, as many of you know, is the world’s largest professional network on the internet, and is striving to keep it that way. To stay the course, LinkedIn has been quickly improving its product and adding new features. In August, I received a LinkedIn Marketing Solutions email update about some “big new features” that were added to the platform. After assessing the full message, I learned that LinkedIn has added a variety of options and capabilities including ‘multi-photo posts’ and a ‘disable comments’ feature, just to name a few. 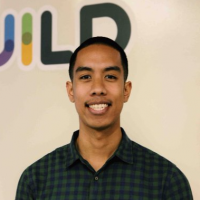 This is exciting because it shows how LinkedIn is embracing recent industry trends in marketing and transitioning into more of a content-based platform. So, what does this mean for marketers? For some, this could be a game-changer. 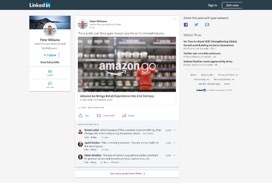 LinkedIn rolling out these new functionalities means that businesses and users will now have more control over their content and a better ability to personalize that content. I think this change is huge, not only for LinkedIn but for B2B marketers everywhere! In this blog, I’ll take a deep-dive into five new LinkedIn updates that could help you achieve your marketing goals. 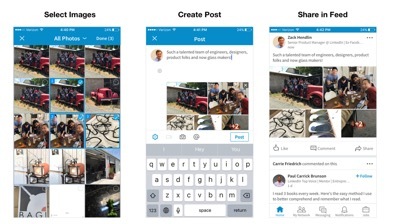 LinkedIn will now give users the ability to select multiple photos in a single post. This is a pretty straightforward addition, but a great one nonetheless. With this capability, you can personalize your content however you want with more images to choose from. This is especially important if you’re looking to get more engagement from your audience. Personally, I’ve been waiting for LinkedIn to implement this feature for quite some time, as I often want to share more than one image from an event, but don’t feel like cluttering my feed. Say goodbye to switching back-and-forth to your camera roll and/or another source. With this feature, you’ll now be able to record and post videos natively from the LinkedIn app, giving you a faster and easier method to share your professional insights and perspectives. According to Forbes, “native videos get 10x more shares than YouTube alone.” You’ll no longer have to go through the lengths of your camera roll and downloads to upload a single video with this option. Simply click the video feature in the app, then either record in real-time or share a previous recording without having to go through another data-source. This will surely speed up the process especially during time sensitive situations. Another A+ addition in my book! One of the biggest challenges for any marketer is maximizing the exposure and viewership of your content. For LinkedIn business users, sharing your content meant sharing only to your connections/followers, which of course, could only go so far (unless you’re willing to boost your post with paid advertising). If you’re looking to expand your reach, this new feature will come in handy. Guests and logged-out users will now be able to see your posts, videos, and articles on the platform. Why is this so important? Because your precious content will now appear to readers who aren’t logged in to LinkedIn. Better yet, they don’t have to be a LinkedIn member. Talk about capitalizing on your content sharing! Typically, when you create a post as a “Draft” on any content management platform, only the author is given access to view it. This could be troublesome for many organizations because you want to share a post with a client or manager to get their input. In order to do that you’d have to draft an email with your text copied and pasted in it. However, you also have the option of creating a shared Google Doc or Dropbox, which is something I’ve done in the past. The good news is that LinkedIn has answered the call for users looking for an approval process for their LinkedIn Pulse articles that want to avoid having to go through other sources and off-platform. What’s the solution? LinkedIn has created a feature that allows you to share your draft articles and blogs before publishing. So, if you’re looking for some feedback on a piece you’re about to send out, you now have the option to “Share Draft”. Keep in mind, your drafts will only be available to those who have a direct link that you choose to create. And finally, the feature that gives you control over your comments. One of the most frustrating things as a marketer is seeing an irrelevant or raunchy comment on a post you’ve toiled away on. These days, you never know what to expect out of your audience and what they could possibly say. 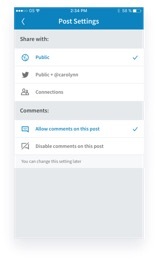 As part of LinkedIn’s ongoing efforts to provide a professional environment that encourages you to share your thoughts, they’ve rolled out the ability for users to manage their comments on their posts and articles. This is especially helpful for your those who manage content daily. This added feature gives you the ability to enable and disable comments on your posts. All it requires is just a few clicks of your mouse (or finger, if you’re operating on your mobile phone) to prevent your audience from seeing comments that may detract from your original intent. These new features are a win-win. They allow you to properly manage your content and maximize your potential reach with your audience. As marketers, it’s important that we take these new concepts into consideration as they’ll allow us to more effectively drive our content. That said, if you haven’t tested the new updates on LinkedIn yet, I suggest you do. What other methods do you use to boost and manage your content on LinkedIn or other social platforms? I would love to hear your thoughts!